Petro-Points is the latest Canadian program to go through a revamp and the program has become easier to understand in terms of earning and redeeming. This is nice change as the two big Fuel Rewards programs in Canada, Petro-Points and Esso Extra weren't the most straight forward with the latter still in the more 'confusing' state in terms of earning and redeeming. The new Petro-Points program essentially has two earning rates, one for the fuel you buy and one for purchases made in store. For fuel purchases you'll earn 10 Points per litre which for most consumers is double what it offered before for regular clean fuel (was 5 points per litre) and slightly more for mid-grade (was 7 points per litre) In-store you'll earn 10 points per dollar spent this is significant to note and we'll cover this in a post later this week. The in-store was 20 points per dollar previously, which depending on how you redeemed those points was equivalent to the new 10 points per dollar but in some cases the old rate provided a better return when redeeming for select rewards like gift cards. On the redemption side, the best part of the program is the one set rate it has for most redemptions. 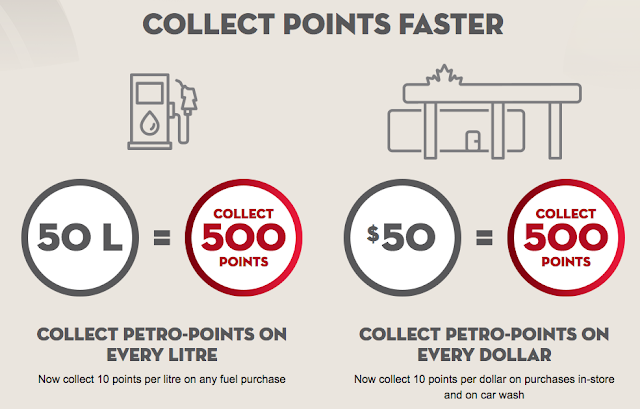 1,000 points equals $1 or basically a 1% return on in-store purchases or a variable return on fuel depending on what the price per litre is. That rate is very similar to what it was before in the program just less confusing. This redemption rate is usable for dollars off fuel, car wash and in-store purchases and is also the same rate for partner rewards with BCAA, CAA, Itravel2000, Hudson's Bay & Dollar Car Rental. You can still redeem points for fuel savings rewards as well. 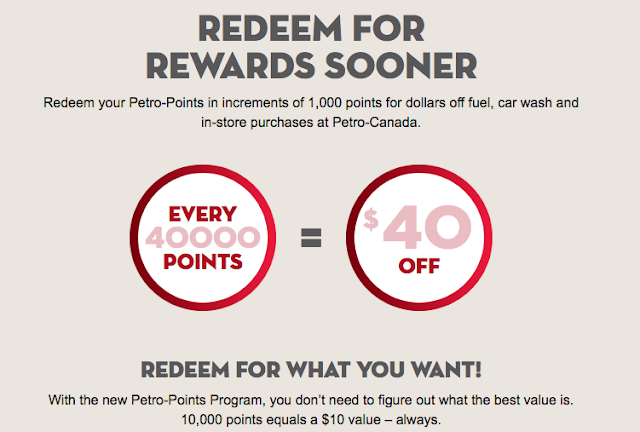 Overall its nice to see Petro-Canada move their rewards program to a simpler structure. The program has become more rewarding for those who are buying regular or mid-grade fuel but on the other end for some it may be less rewarding for those who were making in-store purchases and redeeming for gift cards.